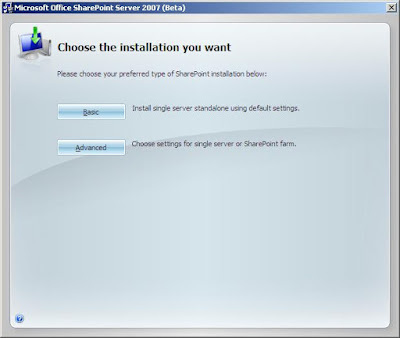 In this post, I'll demonstrate with words and screen shots how to install and get working a portal using Microsoft Office SharePoint Server 2007. Installing this product is not difficult, but it does require some forethought and planning. You can use this post as a reference for getting your version of MOSS 2007 installed. You need to have downloaded the software from Microsoft's site. For information on how to do that, please go here. Once you have registered and downloaded the software, you're ready to start. First, you'll need Windows 2003 Server, fully patched and ready to go. I believe I've seen blog postings recently that indicate that you can install MOSS07 on a Vista server. I'll leave that discussion for other threads and posts. Once you have the operating system ready to go, you'll want to start by running the setup.exe for MOSS 2007. Figure 1 illustrates that after you start the installation process, you'll need to enter a valid product identification key code. This key code can be found on the download site and should have been a part of what you did to get the software in the first place. After entering the product identification key code, click Continue. The next screen is the licensing agreement screen. Now, I always recommend that you read the licensing agreement since it is a legal document and you are bound by its' terms. But I also recognize that in the 10+ years I've been in this industry, I've never seen an agreement that I didn't agree with.............if you get my drift. 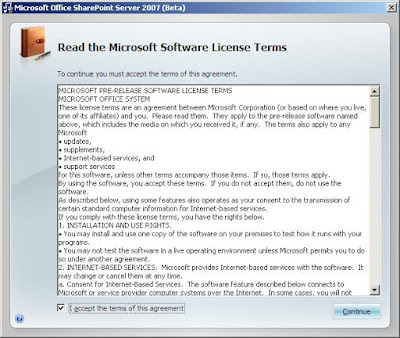 Figure 2: Licensing Agreement Screen. Be sure to select the "I accept the terms of this agreement" check box and then click Continue. The Advanced option is selected by those who wish to install MOSS 2007 selecting some of the customizable features. In this illustration, we'll select the Advanced option and follow that route. · Complete: Enables all of the options for one server to offer the entire range of MOSS 2007 services and features to the network. You can scale out this deployment, start and stop services on this server and use a SQL server to host your databases. · Web Front End: Enables only those options that allows the server to run as a web front end server. What this means is that server is merely the entry and exit point (or one of them among the other WFE servers) for the farm. The actual servers that users will consume will be hosted on other servers (presumably). This cannot be the first choice of a farm unless you plan on installing other servers in the farm to offer the services and features that users will want to consume. · Stand-Alone: Similar to complete, this option enables all of the services and features for the MOSS 2007 farm, but assumes that there is no SQL server, so the MSDE engine is installed locally on this server. You cannot scale out this server into a larger MOSS 2007 farm. Note that in reality, all of the MOSS 2007 binaries are installed in all three choices. All these choices really do is (pragmatically, not technically) turn on and off the code that is required for the server to fulfill the functions that have been assigned to it. Note also that you can select the location where the binaries should be installed in the File Location tab and then sign up to give feedback directly to Microsoft if you'd like to do this. Make your selections, then click Install Now. During the installation, you'll be presented with a status bar that is illustrated in Figure 5. 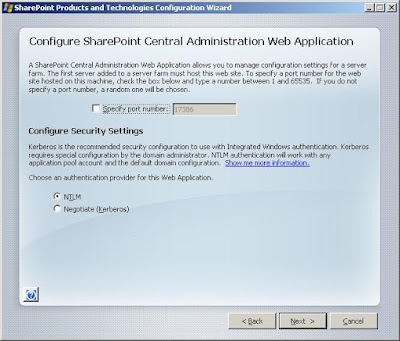 After installation has completed, you'll be given the chance to run through the SharePoint Products and Technologies Configuration Wizard (Figure 6). 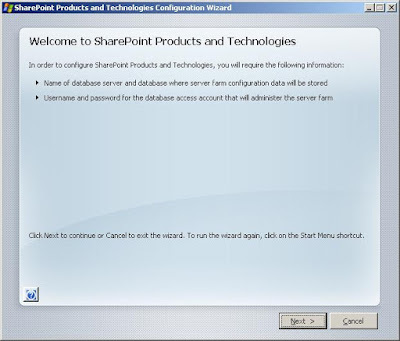 You'll use this wizard to commit the initial configuration options for your new SharePoint farm. One you start the SPPT wizard, you'll receive a pop-up box (Figure 7) that will inform you that certain services are going to be stopped. Be sure it is a good time to stop these services before moving on with the configuration options for your farm. 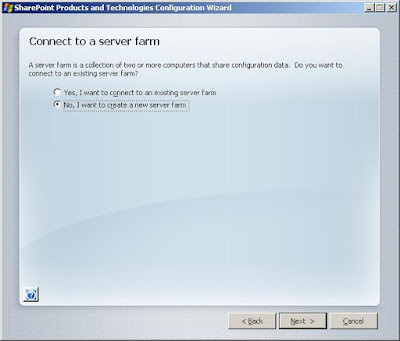 The following set of screens in the SPPT Configuration Wizard are design to help you setup the farm. In Figure 8, you'll be able to create a new farm or join and existing farm. 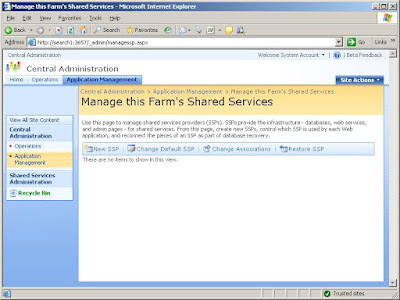 Farm membership, at the server level, is determined by which servers are using the same configuration database in SQL and which servers are not. In my illustration, I want to create a new farm, so I select the "No, I want to create a new server farm" radio button. If I had wanted to connect to an existing farm, I would have selected the other radio button. · The SQL database server name. I'm not clear if this is the host name or netbios name, but I suspect this is the host name. However, you don't need the FQDN here, but you do need name resolution to this server or SQL Instance. 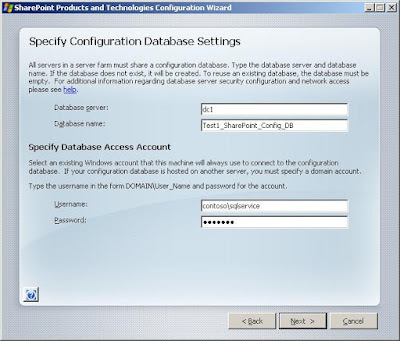 · The database access account will need to be a member of the local admins group on each SharePoint server along with having db_creator and db_security permissions in SQL. I would suggest you have an account setup just for this purpose in your Active Directory and that you have a strong password associated with this account. Figure 9: Configuration Database Settings Screen in the SPPT Wizard in Figure 10, you'll be asked to decide which type of security settings you want to use for your farm. 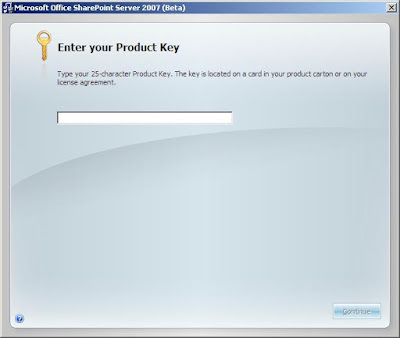 First, you can specify a pre-selected port number for central administration to run on or you can allow the wizard to randomly assign a port number. As you can see, this instance of the wizard randomly selected 17386 as the port number for Central Administration (CA). If you want CA to run on a different port, then select the check box and enter the desired port number. The issue of NTLM vs. Kerberos is one that you may at some point wish to consider. Do you want the CA application to run using NTLM (NT Lan Manager) for security authentication or Kerberos? If the latter, there are some special configurations you'll need to complete for your Active Directory (AD) before Kerberos will work. I'm finding that most administrators are happy with NTLM, though those in a larger and more secure implementations are increasingly using Kerberos. For purposes of my illustration here, I'm selecting NTLM. 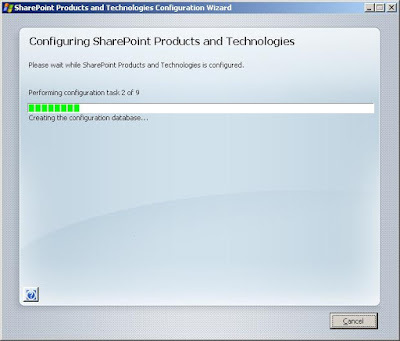 After you click Next, you'll be given a status bar that indicates how the SharePoint configuration is going. Depending on the type of server you're installing and the options you're installing, you could have as few as seven tasks or as many as eleven. Figure 11 illustrates the progress screen. Note that the caption below the status bar will inform you about the configuration actions that are being executed during this process. Figure 11: Configuration status bar screen in the SPPT Wizard After the configurations have been executed and committed to the SQL Server database, we finally get to CA where we can further configure our farm. We can start and stop services (Figure 12) on this server and then create web applications. 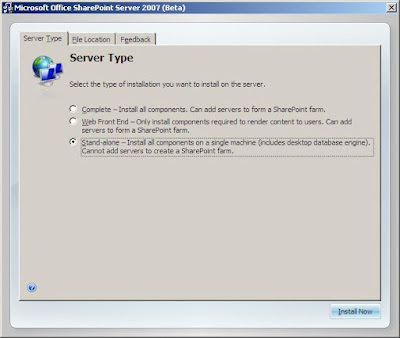 In order to have portal, you'll first need to start the Office SharePoint Server Search service and then create a Shared Services Provider (SSP). I'll start the search service. 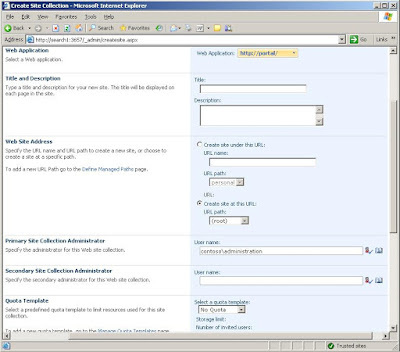 Figure 12: Services configuration screen in CA When the search service is started, you're presented with another web page for search configuration administration that needs to be completed before the search service can start. The configuration options are pretty clear. Out of the shoot, you'll use this server for both indexing and servicing queries from users until you can get enough servers in your farm to quarantine those options in your farm. Select a location that has enough disk space for your indexes. You should plan on a space allotment of 20% relative to the amount of information you wish to index. You'll also need to input an email address, a service account and whether or not there is a dedicated WFE for all crawling activities. For now, in my illustration, since this is the first server in the farm, I'll accept the defaults and click OK.
After starting the search service, the next thing I need to do is create a SSP. 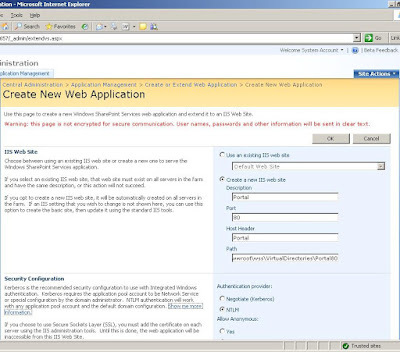 In order to do this, I'll navigate to the Application tab in CA, click Create or Extend a Web Application, then click Create a New Web Application, then make the configurations necessary that you see in Figure 14. Most of this is pretty self-explanatory, so I won't go through each input in detail. Suffice to say that I've done two things not illustrated here. First, after creating this web application, I then web back into CA, selected the Create or Configure Core Farm Services, then selected New SSP (Figure 15) and then filled in the configuration information for the new SSP. All of the options on that page are self-explanatory, except that you must select an Index server for the SSP to operate.Backtracking just a bit, you can't have an Index server unless the Search services is started. So, that's why I illustrated starting the search services first, then creating an SSP, then creating a portal. 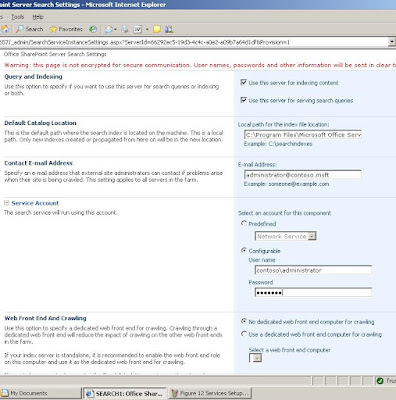 Figure 15: Illustration of the SSP management interface where you can select to create a New SSP. Once the SSP is created and the web application for the portal has been created, you can then create the portal. The way to do this is to navigate to CA and then click Create Site Collection. Be sure the http://portal is selected in the drop down list in the upper right-hand portion of the screen (Figure 16). Note that on this screen, you'll need to ensure that you are creating the site collection at the root by selecting the "Create Site at this URL" where the URL path is "root", not in the Sites managed path. Also, if you scroll down, you'll need to select the Corporate Intranet Site under the Publishing tab. Microsoft has renamed the Portal to Corporate Intranet Site and placed it under the Publishing tab for web content publishing purposes. BTW, even though I don't illustrate it here, be sure to give the site a title. At this point, you should now have a new portal, ready to aggregate, organize and present content for your enterprise, division or department.